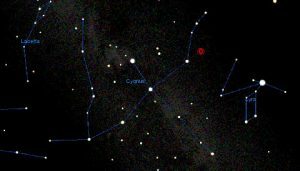 Astronomers suspect that a binary star system in Cygnus is preparing to make one star of two, erupting in a red nova that will be visible to the naked eye. If Lawrence Molnar (Calvin College) and his colleagues are correct, the two stars in the binary KIC 9832227 are about to merge. 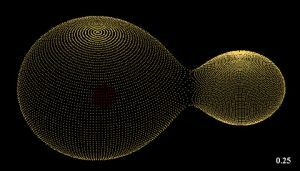 A simulated view of the contact binary system KIC 9832227. The larger star is about half again as wide as the Sun, whereas the smaller one is about 80% as wide as our star. The system lies about 1,800 light-years from Earth. Astronomers have already (probably) observed a stellar merger. In 2008, the star V1309 Scorpii revealed its existence when it suddenly flared. Follow-up work by Romuald Tylenda (Nicolaus Copernicus Astronomical Center, Poland) and colleagues, using more than 2,000 archival observations from the Optical Gravitational Lensing Experiment (OGLE), determined that V1309 Sco was likely a contact binary star. Contact binaries are stars that orbit so close together, they kiss. They can even share a common outer atmosphere, like two peanuts inside their mutual dumbbell shell. At first, Tylenda’s team concluded, V1309 Sco’s two stars orbited each other about every 1.4 days. That period shortened exponentially with time as the stars’ outer atmospheres combined to wrap them both in a single envelope. When this happened, the object began to brighten, then faster, until the two stellar cores merged, releasing energy and dazzling observers with an outburst 10,000 times brighter than the contact binary’s original luminosity. Molnar’s team argues that KIC 9832227 is en route to the same fate. 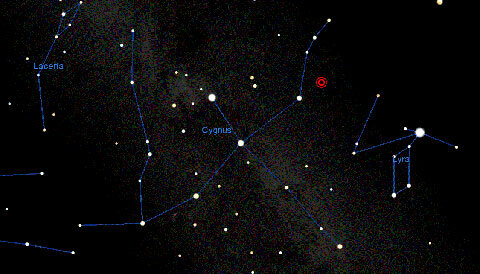 The contact binary KIC 9832227 (red circles) is located in the constellation Cygnus, the Swan. Although astronomers aren't sure how bright it will become if the stellar pair mergers, it could potentially rise to 2nd magnitude, easily naked eye. This 12th-magnitude binary lies in the constellation Cygnus, with a current orbital period of about 11 hours. Back in 2013, one of Molnar’s students had discovered that the period was growing shorter; follow-up work showed the change was accelerating, as V1309 Sco’s had before its eruption. Molnar suggested in 2015 that KIC 9832227 might be heading toward a crash, but at the time his group wasn’t sure if the change was due to a distant, unseen companion star instead. Using a variety of observations spanning 17 years, the team has now found a closer companion — which might have driven the binary into contact in the first place — but nothing farther out that could explain the apparent change in period. They also found that the period has continued to shorten, as expected if the stars are spiraling in toward each other. Although the overall change is only about 1 second, that’s notable in a field with eight decimal points of precision. Thus, lacking a solid alternative, they’re going with the imminent merger scenario. Using V1309 Sco as a model, the astronomers predict that KIC 9832227’s duo will merge in 2022, give or take a year. Molnar announced the gutsy prediction January 6th at a press conference at the winter American Astronomical Society meeting in Dallas. Light from V838 Monocerotis's eruption in 2002 is still propagating outward, lighting up the material around it in this Hubble image from 2006. Even assuming this explanation is the correct one, there are still several unknowns. For example, the astronomers don’t know when the outburst will begin. V1309 Sco started brightening nearly 2 years before its great flash, but given KIC 9832227’s characteristics, its uptick might only begin a month in advance, the team estimates. 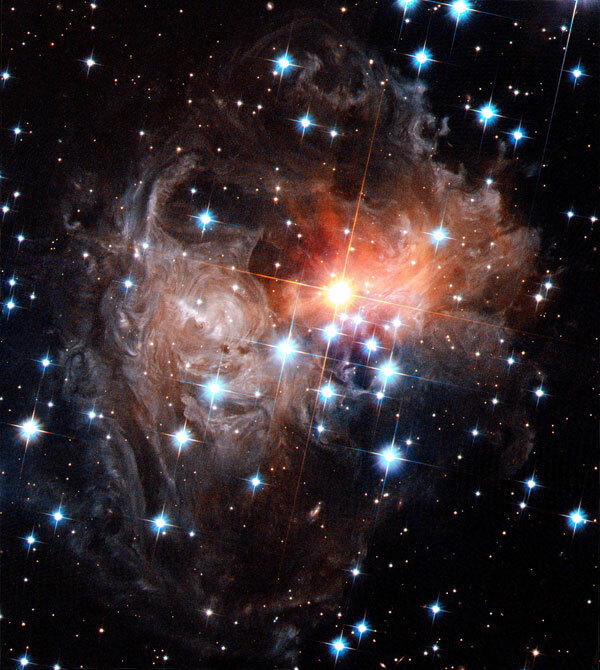 V1309 Sco is a member of a larger category of stellar outbursts called red novae. The token example of this class is V838 Monocerotis, sighted in 2002 and known for the spectacular Hubble Space Telescope images of its light echo illuminating surrounding dust. But astronomers are hesitant to assert that mergers could explain all red novae.